Freezing rain and black ice contributed to multiple accidents around the Triangle Sunday morning. RALEIGH (WTVD) -- Widespread crashes were reported across the Triangle Sunday morning as freezing rain mixed with icy patches from earlier winter weather to cause problems for drivers. One of the worst areas was a multi-vehicle accident at I-540 at Aviation Pkwy in Wake County involving about a dozen vehicles. ABC11 meteorologist Steve Stewart said while air temperatures high up were warm enough for light rain, temperatures at the ground level were much colder - causing the moisture to freeze - particularly on bridges and overpasses. There were no serious injuries in the 540/Aviation Pkwy crash. One driver said once one car spun out, it was like a domino effect. About a dozen cars were involved. Problems were also reported on I-95, I-85, I-540, I-40, US 1, US 70, Hwy 264, and many others. North Carolina Highway Patrol said it responded to 23 in Wake County alone. Vance County had 9 wrecks on Sunday, according to Highway Patrol, and Nash County had 11 weather-related accidents. Meanwhile, Raleigh-Durham International Airport had to cancel about 50 flights on Sunday due to the icy conditions. About 50 flights canceled today. Other flights taking off and landing. Contact airline if you have travel plans. The North Carolina Highway Patrol cautioned drivers to watch out for bridges and overpasses before they get to them and slow down accordingly. Troopers said if you're driving and you feel your wheels losing traction it's recommended you not hit the brakes - as that will just increase the slide. Take your foot off the gas and try to steer out of the slide. To the south, ABC11 crews found icicles hanging from road signs in Harnett County and drivers reported slick spots. There were minimal reports of power outages. ABC11 received a report of fallen branches blocking roads in Durham. "The heavy snow that we had weakened a lot of branches. A tenth of an inch of ice should not snap any branches. Some branches might be weakened, which can still cause power outages. If we get more reports of fallen branches, I'd say that's whats happening," said meteorologist Steve Stewart. Slick roads in Raleigh, Durham, and other parts of Wake County caused several damage-only fender benders on Saturday. 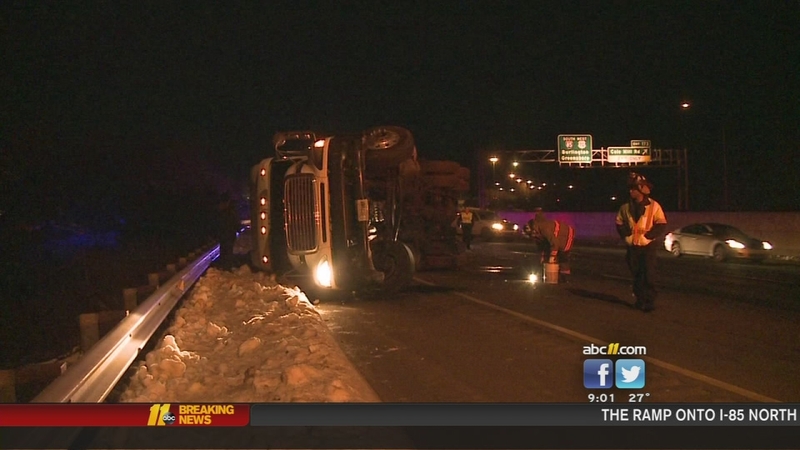 A tractor trailer flipped in Durham near the ramp onto I-85 north from 15-501. That ramp was closed for several hours, reopening just before 8 a.m. It's even enough to make drivers like Wanda Woods, born and raised in Chicago, think twice about getting on a road where ice is either visible or lurking, unseen. "I can drive it, but I dare not," Woods said. "It's not me, it's them. They don't even brake properly," she added, pointing to a car that barely rolled to a stop before turning in to traffic. Woods is especially concerned about drivers who drive too fast or tailgate, even during severe weather and its slippery aftermath. "You don't know what's going on with my car! I could have bald tires. I could be stalled out. Why are you up on my bumper like that?" She hopes people who see video of the icy conditions and the wrecks will realize they could endanger themselves and others if they're not paying attention. "Wherever you're going, you ain't gonna get there if you're dead, right? So slow down, be courteous and just use common sense," she said.